Christmas, Catholics, Pagans, and Atheists – Oh, My! Instead of merely reposting my piece on the true, non-pagan, origins for the December 25th date of Christmas, I share this link to a wonderful piece by Rev. Dwight Longenecker which does an excellent job of explaining (yet again) once and for all the true background of the Christian celebration of Christmas on December 25th. 1. The “pagan origin” claimants begin with the capital mistake of assuming that mere resemblance proves causality. Simply because two things resemble each other does not mean one is the cause of the other. Two things can be strikingly similar yet share absolutely no causal relationship what-so-ever. Simply because Christians and pagans observed certain feasts at similar times throughout the year does not mean one automatically caused the other. 2. The Roman feast most often associated with Christmas by the “pagan originists” is Saturnalia, a Roman feast for the god Saturn which was held from December 17 to 23. However, this feast, while occurring on the wrong date (if Christianity “co-opted” this feast, why not make the date of Christmas December 17th to really sock it to those pagans? ), also had nothing to do with the imagery of the solstice and the return of the sun. The focus of this feast centered more on the theme of sacrifice-to-appease-the-gods-for-a-good-harvest. 3. The Roman feast associated with the solstice was Dies Natalis Sol Invictus. The only problem here is the inconvenient fact that this feast wasn’t instituted until around AD 278, well after the spread of Christianity throughout the Roman Empire, and for quite some time remained a rather minor feast with a small cult. Further, we find no evidence that Sol Invictus was celebrated on December 25th until AD 360 – decades after Emperor Constantine’s conversion to Christianity in AD 315. In fact, the promotion of the feast was due to the influence of Julian the Apostate who attempted to turn back the tide of Christianity sweeping the Empire. Huh, so that means Sol Invictus was used by the Roman authorities in an attempt to “win back” Christians to paganism, not the other way around. 4. The “pagan origins” nonsense completely ignores the fact that thousands (some sources say millions) of Christians lost their property and in many cases their lives over their complete refusal to, as Rev. Longenecker puts it, “offer so much as one grain of incense to the pagan gods.” Yet, the “pagan originists” would have us believe the very people who were giving their lives over refusal to participate in anything even resembling paganism suddenly decided to “co-opt” pagan festivals. 5. If we actually take time to read the historical record provided us in the writings of the early Church Fathers, we find a clear answer as to why Christmas is celebrated on December 25th. As early as AD 386, we find a sermon by St. John Chrysostom linking the date of Christmas to the date of the Annunciation (the day the Angel Gabriel announced to Mary that she would conceive and give birth to Jesus). The wording of his sermon suggests this linking was already a long-accepted tradition within the Church. We need to remember early Christians were primarily Jewish converts and thus the roots of Christianity are in Judaism, not Romanism. The Jews believed the world began on March 25th. They also believed great men died on the same date as the date of their conception. Therefore, we find the early Christians believed the date of Jesus’ conception was March 25th. Let’s count nine months and see what we find: December 25th. So, just as I pointed out last time, the date of Christmas has nothing to do with Romans or paganism, but everything to do with early Jewish belief and the dating of Jesus’ conception by early Christians. The royalty of Christ rests upon a twofold basis. He is our King by right of birth and by right of conquest. The first refers us to the personality of the Son of God, whereby, in His divine nature as God and by virtue of the hypostatic union, He is the sovereign Lord and Master. The second places before us the God-Man coming down on earth to rescue fallen man from the slavery of Satan, and by the labors and sufferings of His life, and passion, and death, to win a glorious victory for us over sin and hell. Almighty and everlasting God, Who in Thy beloved Son, the King of the whole world, hast willed to restore all things, mercifully grant that all the families of nations now kept apart by the wound of sin, may be brought under the sweet yoke of His rule: Who with Thee liveth and reigneth. Christ is the King of the Church, and the Peacemaker through His Blood. Brethren: Giving thanks to God the Father, Who hath made us worthy to be partakers of the lot of the saints in light: Who hath delivered us from the power of darkness, and hath translated us into the kingdom of the Son of His love, in whom we have redemption through His Blood, the remission of sins; Who is the image of the invisible God, the firstborn of every creature: For in Him were all things created in heaven and on earth, visible and invisible, whether thrones, or dominations, or principalities, or powers: all things were created by Him and in Him. And He is before all, and by Him all things consist. And He is the head of the body, the Church, Who is the beginning, the firstborn from the dead; that in all things He may hold the primacy: Because in Him, it hath well pleased the Father, that all fullness should dwell; And through Him to reconcile all things unto Himself, making peace through the blood of his cross, both as to the things that are on earth, and the things that are in heaven, in Christ Jesus our Lord. 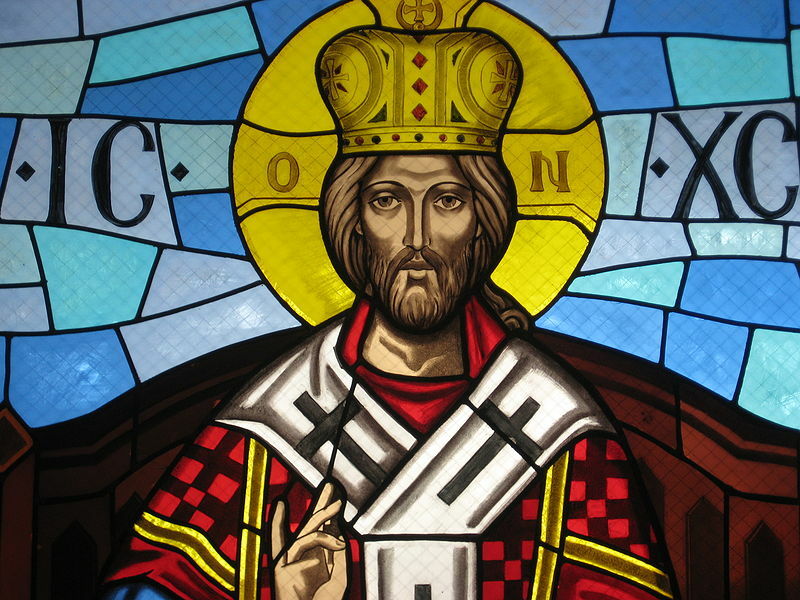 Christ proclaims His kingly dignity and power. “The glory of God is man fully alive; but man’s life is the vision of God,” St. Irenaeus declared in Adversus haereses. [i] This phrase points to man’s ultimate and objective end. The current crisis in moral theology is mainly attributed to losing sight of a correct anthropology of man. In order to reestablish a correct view of moral theology, we must first reestablish a correct view of man. For us to see clearly the ultimate end of man and the objective nature of that end, we must begin with a correct understanding of the nature of the soul. Through this integration, the words of St. Irenaeus become clear and firmly establish our moral compass. [i] As quoted in: Fr. Brian Mullady, O.P., Man’s Desire for God (Bloomington, IN: 1st Books Library, 2003), ix. [ii] Fr. Brian Mullady, O.P., Both a Servant and Free: A Primer in Fundamental Moral Theology (New Hope, NY: New Hope Publications, 2011), xi, xiii. [iii] Catechism of the Catholic Church: 2nd ed. (Washington, DC: United States Catholic Conference, 2000), 356-357, 364- 367. [iv] Thomas Aquinas, Summa theologiae, I-II, q. 1, a. 1, at New Advent, http://www.newadevent.org; Mullady, Man’s Desire for God, 34. [v] Mullady, Man’s Desire for God, 34-35. [vi] Mullady, Man’s Desire for God, 36-37. [viii] Thomas Aquinas, Summa Contra Gentiles, III, 25, 11; III, 48, 9, Joseph Kenny, O.P. (ed.) (New York: Hanover House, 1955-1957) at Priory of the Immaculate Conception, http://dhspriory.org; Mullady, Man’s Desire for God, 42-43. [ix] Mullady, Man’s Desire for God, 1-12. [x] Mullady, Man’s Desire for God, 12-13, 15, 19. The Liturgy reminds us today of the great commandment of charity towards God and our neighbor: “The precept is twofold,” declares St. Augustine, “but charity is one.” We love God above all and our neighbor for His sake. Da, quaésumus, Dómine, pópulo two diabólica vitáre contágia: et te solum Deum pura mente sctári. Per Dóminum. Grant, O Lord, unto Thy people grace to withstand the temptations of the devil, and with pure minds to follow Thee, the only God. Through our Lord. The unity of our faith, like the unity of the Persons of the Most Holy Trinity, imposes on us the duty of being united in the bonds of charity. Brethren: I therefore, a prisoner in the Lord, beseech you that you walk worthy of the vocation in which you are called. With all humility and mildness, with patience, supporting one another in charity, careful to keep the unity of the Spirit in the bond of peace. One body and one Spirit, as you are called in one hope of your calling. One Lord, one faith, one baptism. One God and Father of all, Who is above all, and through all, and in us all; Who is blessed for ever and ever. Amen. 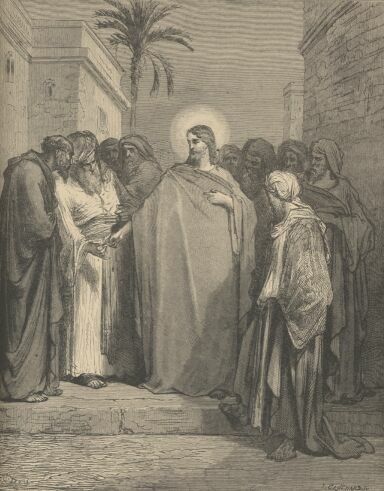 At that time the Pharisees came to Jesus, and one of them, a doctor of the law, asked Him, tempting Him: “Master, which is the greatest commandment of the law?” Jesus said to him: “Thou shalt love the Lord thy God with thy whole heart, and with thy whole soul, and with thy whole mind. This is the greatest and the first commandment. And the second is like to this: Thou shalt love thy neighbour as thyself. On these two commandments dependeth the whole law and the prophets.” And the Pharisees being gathered together, Jesus asked them, saying: “What think you of Christ? whose son is he?” They say to him: “David’s.” He saith to them: “How then doth David in spirit call him Lord, saying: The Lord said to my Lord, Sit on my right hand, until I make thy enemies thy footstool? If David then call him Lord, how is he his son?” And no man was able to answer Him a word; neither durst any man from that day forth ask Him any more questions.